Bancroft 'Flighter'. Large (7 or so and physically measures approximately 57cm internally). Pale tan cotton lightweight cap with a single thickness chocolate brown peak - the sign of a genuine crusher (folding) cap. Yellow satin lining with greasecloth crown. The cap is actually quite clean but does have some moth nips although there are no large holes and the overall appearance is pretty good (see photographs for examples of the moth nips). The peak is excellent, clean on both sides and remains flexible. Excellent one-piece badge with screw post fixing. The greasepaper liner is discoloured / wrinkled as usual but the Bancroft logo is quite clearly visible beneath. The perforated inner leather band is also very clean suggesting little, if any use. It is marked 'Curve Controlled Flighter By Bancroft'. 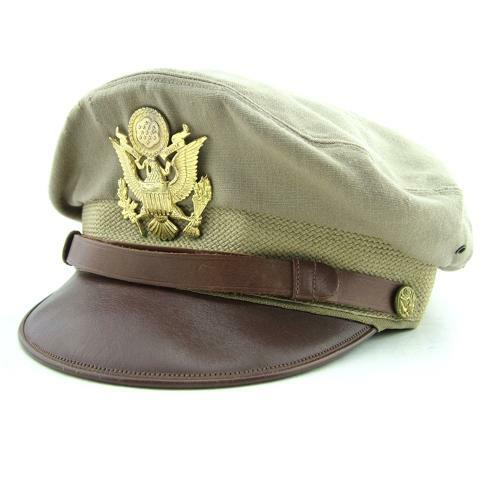 No patent numbers are marked suggesting this is a wartime cap. Named to the owner. Good '+' possibly unused condition. Bancroft caps are considered by most collectors to be the finest available and the 'Flighter' is always highly sought after. Stock code U22900.